The daffs have been blooming for some time now and I love their cherry faces smiling at me as I drive off to work in the morning. I love boxes -- all shapes and sizes, so have been collecting different ones. You know how it goes --once something catches your eye you it changes everything. 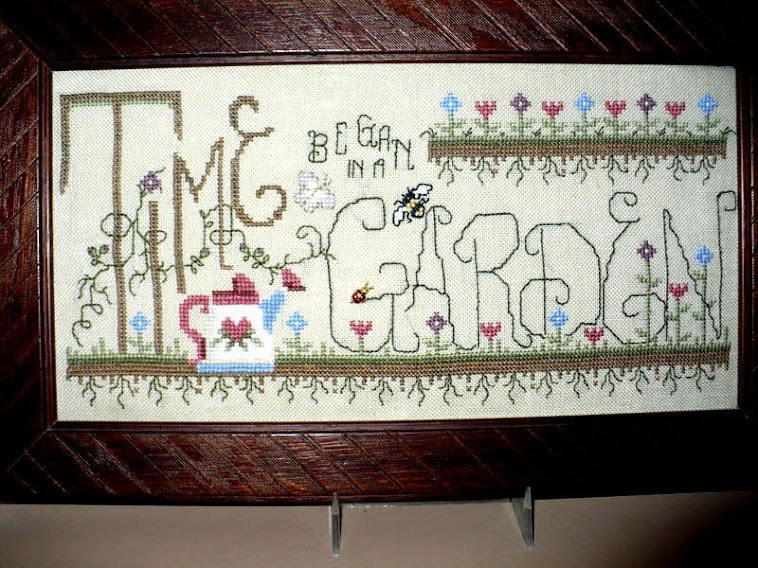 Now when I'm at thrift stores or estate sales, every time a box catches my eye I'm immediately wondering what to stitch for the top of it!. So last night I gathered three that I particularly like, grabbed a crate of CS patterns and started going through them one by one --trying to find the perfect subject for each one and then measure and calculating to see if it would be the perfect size. Thought I had one figured out only to find it was just a little to big. So tried again tonight, found the perfect pattern (if I eliminate a few things) then saw one of the colors called for was Splendor 801 and thought OH NO WHAT IS THAT. So hopped on the web, found my answer, wondered over here to read your updates and haven't left! But the good news is I have the pattern (and threads) to tackle the first box so that will be this weekends new project. Finished Little House#1 in their new series for this year, and have the border on #2 almost finished. Decided to stitch a few small things like this for awhile as I needed the satisfaction of finishing something. And that is fun. Will have to post some pictures. Ok. Bedtime. I've enjoyed reading your posts tonight, as I do many nights. Love seeing your work, sensing your satisfaction (and frustrations at times), reading your tips, getting inspired. Sleep well all you night owls. Sounds like a fun weekend coming up..enjoy the finishing! 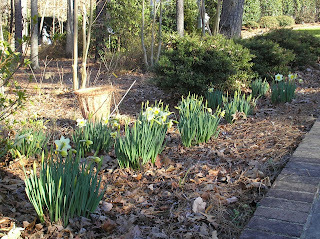 And I hope those daffodils make it through the cold! Ditto what Carolyn said. We were below freezing a couple of nights and people had already put big flower pots out and planted in flower beds. Trees budding and blooming and whammo. It happens every year and we never seem to get it, lol. Enjoy your getaway! First thing: you won Catherine's giveaway at Regaling from Windy Ridge, and need to contact her right away! Now back to our show... love the daffodils. I have ONE right now! If only the weather would cooperate more like Spring! By May you will probably have increased your pile of projects to be finished, and may have a harder time picking ones to bring on your trip! Oh my! Hugs!